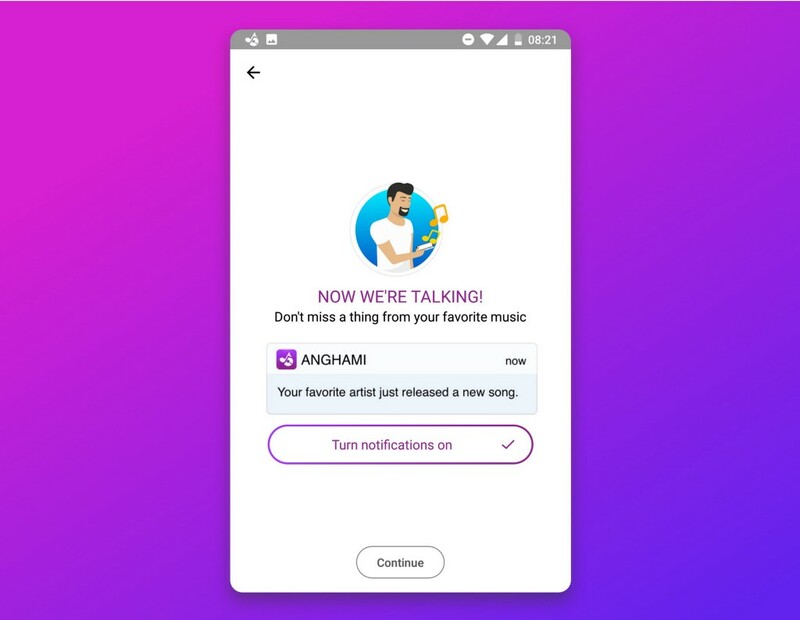 Finally, once users choose their artists, itâs a good time to ask for push notifications, so we can instantly tell users about new songs their favorite artists release.I expected more users to engage but the opposite is true.Instead of having a static list of artists loaded when users scroll, the app requests another set of artists on the fly.Weâre always testing different copy, removing or adding screens to the flow, and trying different ways to recommend music after finishing the preliminary onboarding flow.When a set of artists has a high percentage of common listeners, we considered these artists as âsimilarâ from a userâs perspective.Essentially, this means that a user following one of these artists will likely want to follow the similar artists, even if these artists have a totally different musicÂ style! Although the primary objective was choosing at least one artist, the secondary one was having users choose many artists.Subsequently, it allows us to show a limited set of artists (otherwise it would be thousands of unfiltered artists).The first screen was limited to 14 artists (on average), but users could scroll.Day-1 retention increased by 19% as a direct result of onboarding. 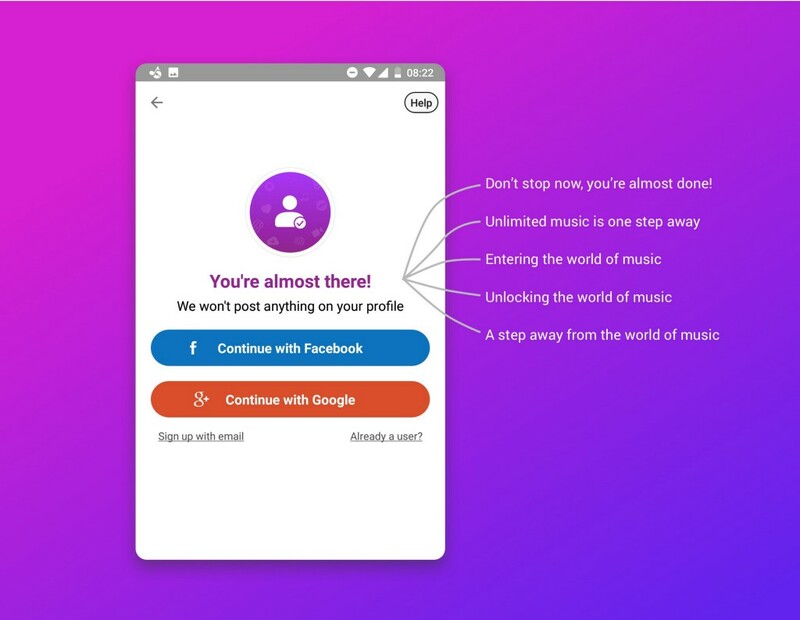 The next screen asks users to signup.We can already tell that users who swipe manually have a 12% higher chance of retention.Users are accustomed to signing up as a first step, especially if itâs one-tap like Facebook or Google.Since our user base is in the Middle East, people think of music in terms of Arabic and non-Arabic (International) music.But it was âLetâs Go!â that performed best, causing 12% more users to signup (I do most of my analytics on Amplitude).So this extra screen resulted in more engagement overall. 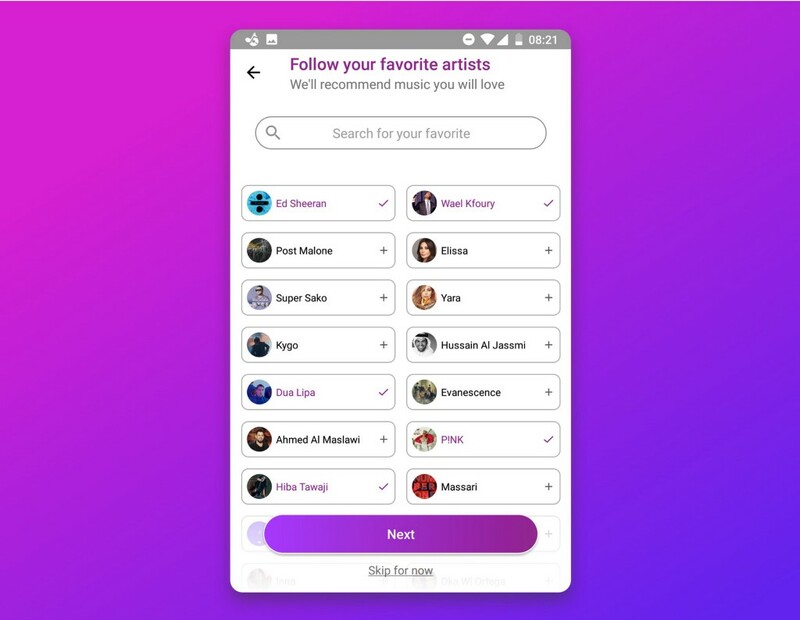 Onboarding new users is a major work in progress.Adding the music language screen caused a 22% increase in users choosing anÂ artist. The selection of artists was still limited to the most popular ones, even with the variety algorithm in place.So we reserved the last 2 artists (out of 14 spots) for indie bands who are not anywhere near the top.Once users identify themselves, they feel a stronger ownership of the app and are more willing to personalize their musical experience.Since Ed Sheeran is more popular than Imagine Dragons, we only showed Ed Sheeran to make space for other âmore differentâ artists.The first few minutes they spend in the app play a crucial role in having the user come back the next day.What if we offered importing music as part of the onboarding? 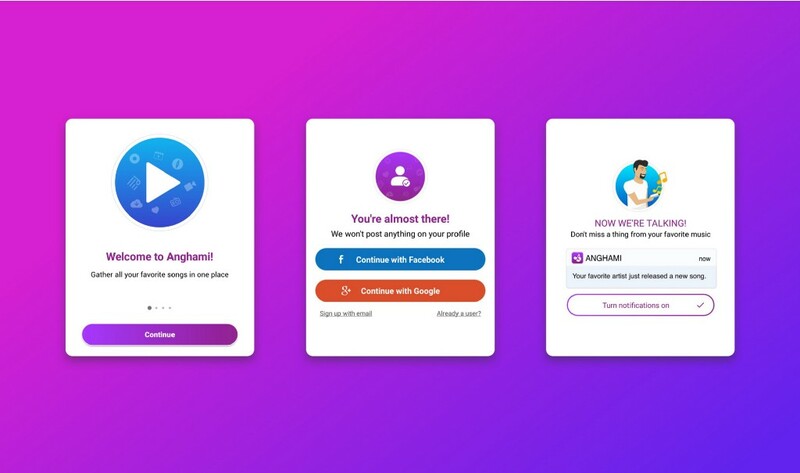 Iâm usually wary of adding extra screens to onboarding so users can start enjoying the app sooner.Indeed, when we talk about music, we either talk about the artists, or whether we listen more to Arabic or English music.Through the course of several months, we modified the customer journey and tried different copywriting, leading to twice as many users completing onboarding.We also tested the title over there.This metric is not affected by wishful thinkingâââIâm not comparing users who already engaged and signed up, but rather users who were merely offered the opportunity to signÂ up. We tested different texts for the Continue button, shown below.The winning phrase had a staggering 30% improvement in signingÂ up! Which one got the mostÂ signups? Which do you think it is? Our tests indicated the first phrase âDonât stop now, youâre almost done!â led users to sign up the most, so an encouraging tone is key for newÂ users. Does requiring a user to complete signing-up affect user onboarding?What encourages users to continue onboarding, and what sets themÂ back?Are the screens weâre adding to onboarding helping users completeÂ it?How can copywriting affect onboarding, especially in the very firstÂ screenTo what extent will proper onboarding affect usersâ retention? 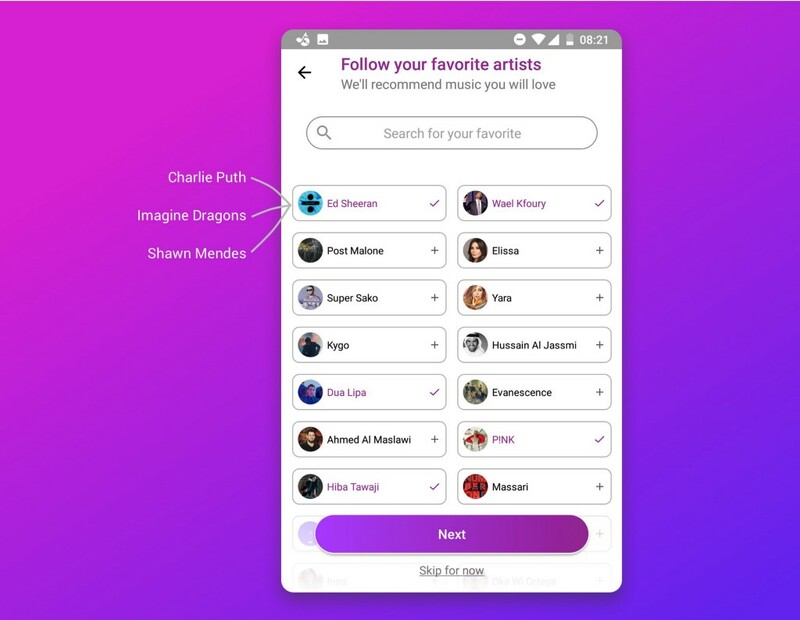 One thing remained.Once the user scrolls down, we instantly load artists similar to what they chose in the initial screen.But we knew that many users wanted indie bands that arenât in the top, and we wanted to communicate that Anghami has all the music users could want.For example, Ed Sheeran is not really similar to Imagine Dragons, but our data shows that people who play Ed Sheeran are very likely to play Imagine Dragons.Itâs not obvious they should choose Rock if they like Lana Del Rey, or that Lebanese Classical will lead to Fairouz.An impressive 68% of users went to next page after choosing an artist, and users chose 13 artists on averageâââplenty for us to give accurate musical recommendations! 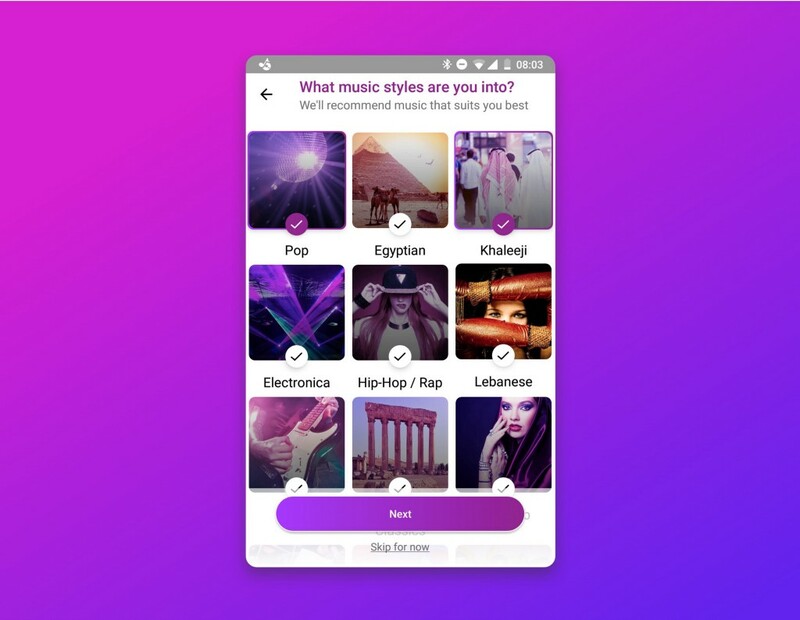 Removing genres proved to be very effective, but one possibly useful filter prior to artists would be the music language.If users didnât choose anything at all, then it means they didnât connect with popular artists, and we switch to showing indie artists only.This easy user task would help us quickly engage the user by personalizing their experience, hence considerably increasing usersâ satisfaction and likeliness to come back the nextÂ day. 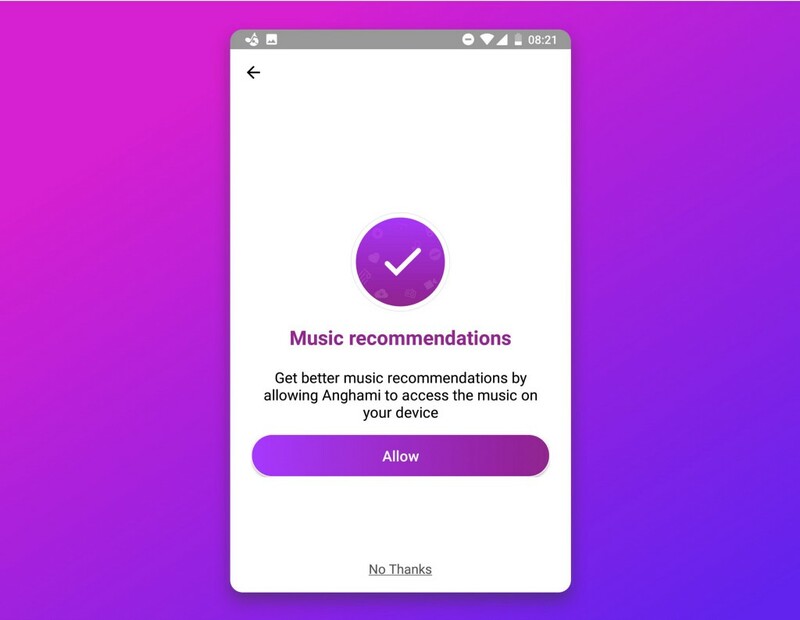 Our onboarding involves several steps, and we consider it complete when users choose their favorite artists.Which do you think performed best? 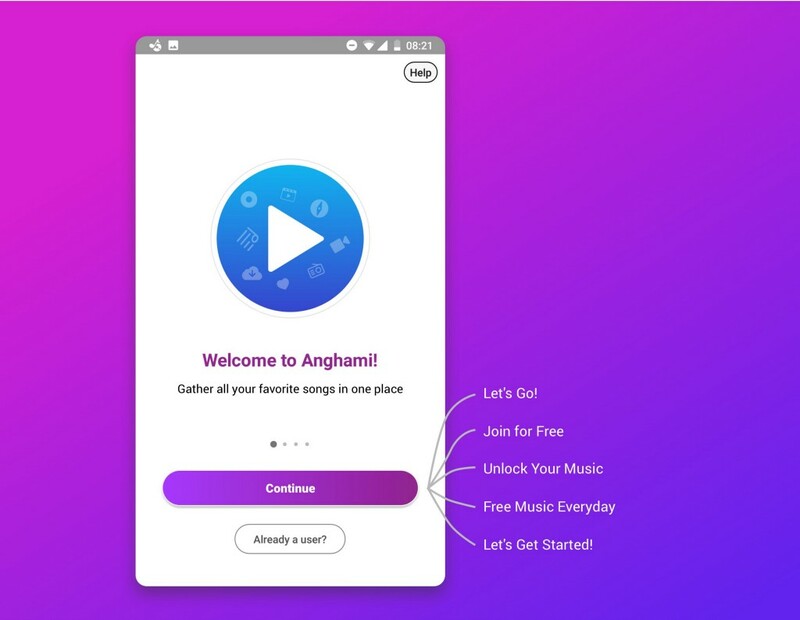 But I was surprised that some users didnât even choose their preferred music language.It is possible that words like free, unlock and unlimited make users think there is a secret catch when signingÂ up. 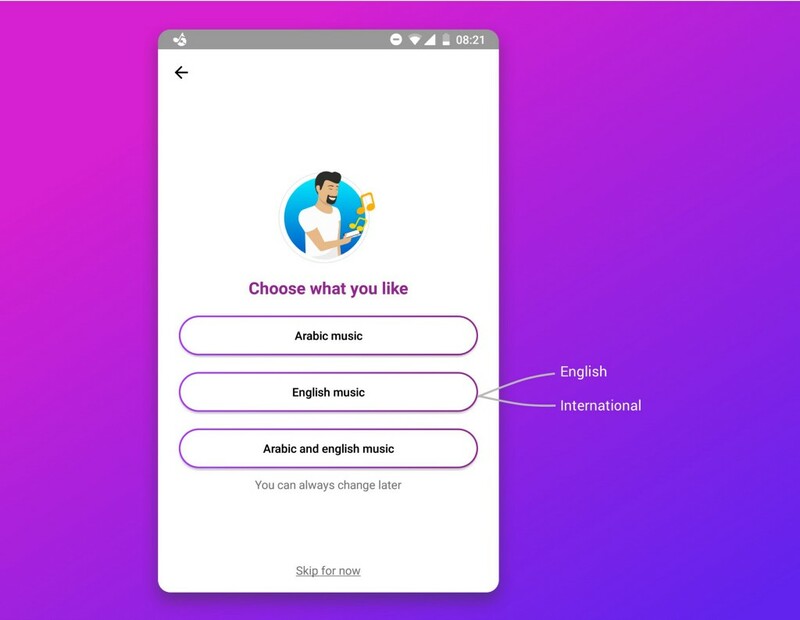 The crucial data we need at this point is the userâs favorite artists.Users who were asked to sign up were 23% more likely to continue onboarding than those who werenât.By changing the term âInternationalâ to âEnglishâ, even though incorrect since âInternationalâ refers to everything non-Arabic, caused a 6% increase of users choosingÂ artists. Do users connect withÂ this?